Stylus azimuth is a curious term and largely inaccurate¹. It refers to the perpendicularity of the stylus to the recorded surface when looking at the cartridge body from the front. It is most evidently betrayed by the clockwise or anti-clockwise tilt of the cartridge body with respect to the turntable platter. So why not just aim to mount the cartridge body so that it isn't slanting with respect to the record surface? The reason is that, despite being a good place to start, azimuth is not necessarily correct when the sides of the cartridge body are perpendicular to the record surface because the cantilever may not be mounted exactly coincident with the axis of the body. And the stylus may not be attached to the cantilever exactly on the same axis either. Because of the difficulty of making an accurate optical judgements, various electronic means have been developed to aid with the adjustment of azimuth. Celebrated amongst these gadgets is the Fosgate Fozgometer from Musical Surroundings. This unit, combined with recorded tones from a test record, may be used to determine correct azimuth by means of measuring and matching crosstalk between the channels as the azimuth angle is changed between test-runs. Stereo Lab uses a technique similar to the Fozgometer to measure and minimise crosstalk between the channels of the cartridge and will automatically correct for azimuth errors. The process is selected by checking the Cartridge Balance and Azimuth check-box in the Phono Preferences tab. The software uses statistical information from the needle-drops, so no special test disc is necessary - and no fiddly adjustments are required. The converted audio file is corrected automatically to compensate for incorrect azimuth. 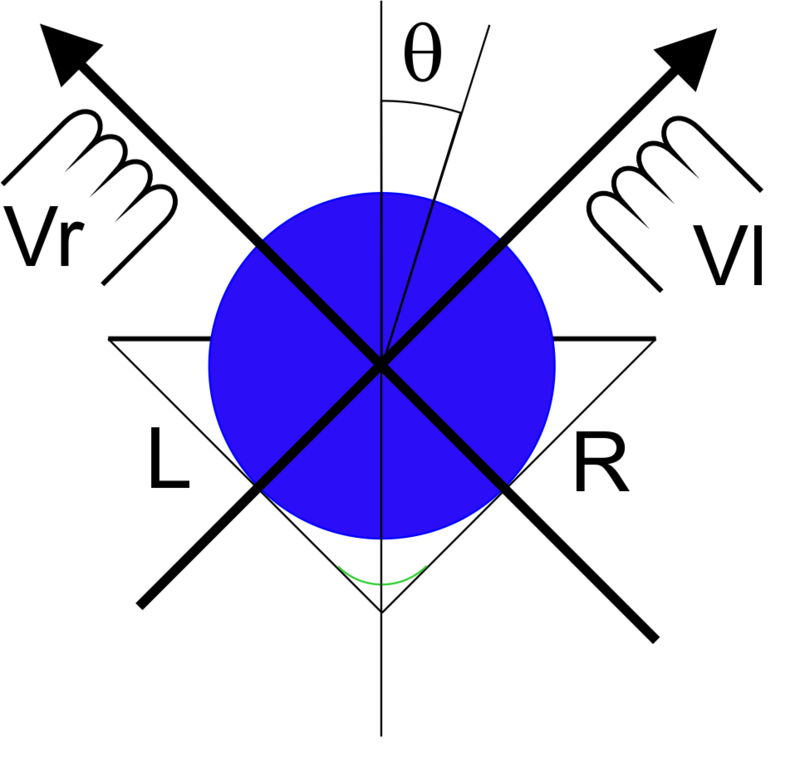 In the diagram, we are looking at a scale-drawing of the stylus radius (the blue circle) engaged in the triangular trench of the stereo groove. The mechanism by which the movement of the stylus translates to movement of magnets near two coils we'll ignore for the moment. We'll just assume a perfect device so that, however the stylus moves, it will move magnets which will induce exactly proportional voltages (Vr and Vl) in the orthogonal coils. Imagine for a moment that only the right-hand-side of the groove is modulated and that the stylus is therefore moving solely along the right-axis. 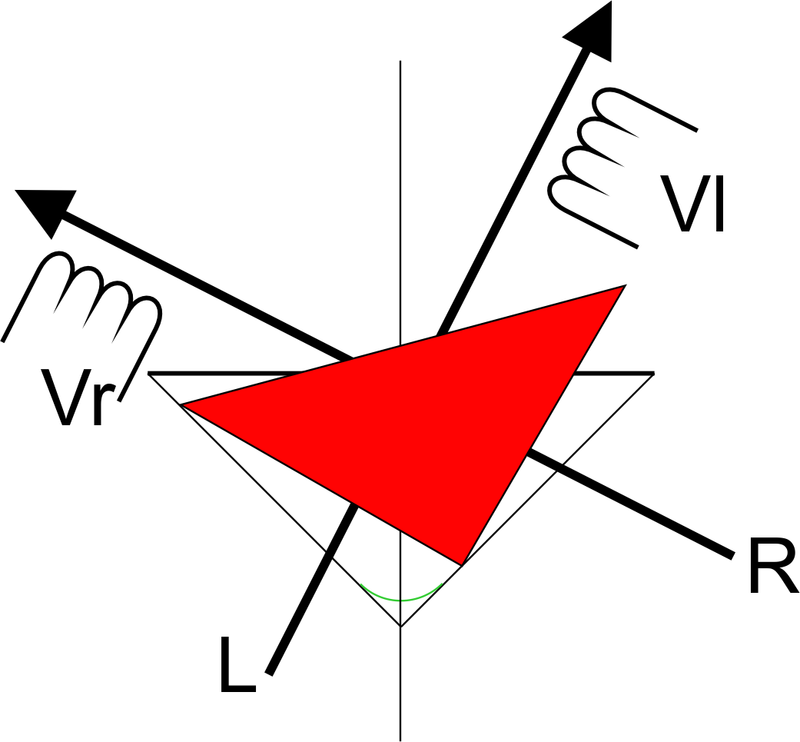 It moves either side of the L axis, but not along it and thus no voltage (Vl) will be induced. This signal modification is exactly equivalent to the change obtained by turning a (properly designed) balance control on a preamplifier, or what happens when a stereo microphone array³ is rotated by angle θ. In other words, it will shift the stereo image in the direction of the crosstalk. 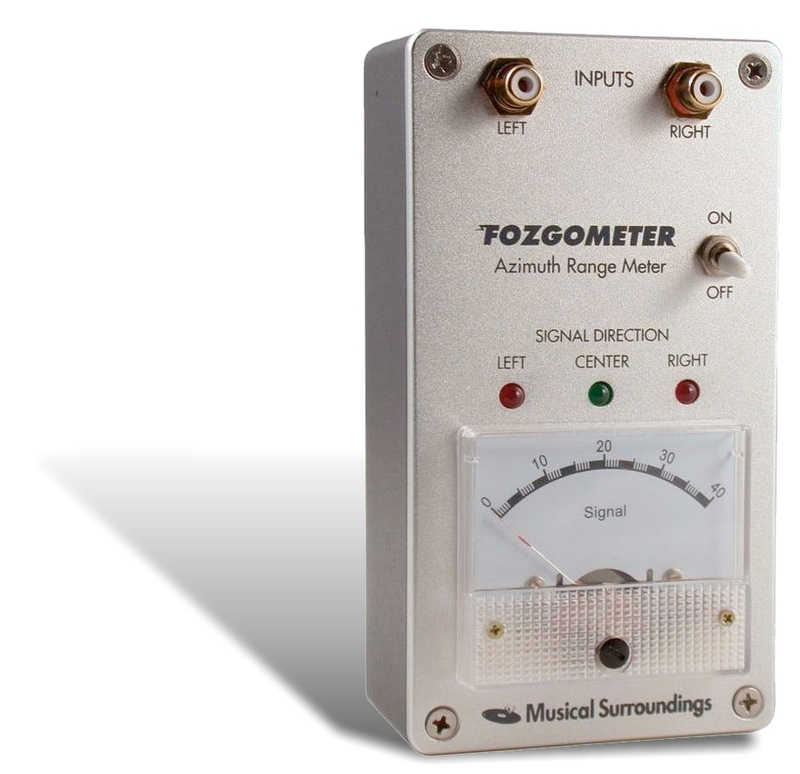 It is this equivalence of balance and azimuth which underwrites the use of electronic ratio detection equipment (like the Fozgometer) to determine correct azimuth. a condition which is satisfied when θ &ap; 6°. The equivalence of imbalance and azimuth described above underpins the perhaps uncomfortable fact that azimuth alignment on the basis of ratiometric detection can result in an non-perpendicular azimuth being adjusted in order to restore an imbalance elsewhere in the transducer. Now this is fine as long as the imbalance is fairly small and the stylus is a conical type. (The mathematical equivalence of azimuth-induced imbalance and intrinsic imbalance in the electrodynamic cartridge is only truly valid for spherical styli.) There is room of conjecture that physically aligning other stylus types ratiometrically may be unwise. 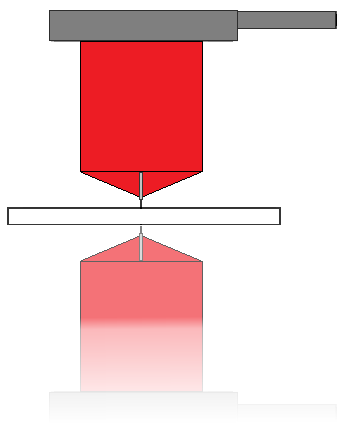 The diagram right illustrates azimuth misalignment of a Shibata/line-contact stylus. Not only is the mathematics described above not valid for a stylus of this profile, but a non-perpendicular azimuth possibly has much more serious consequences (on tracking and groove-wear for example) when considering these types. 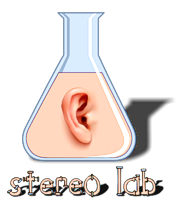 The Balance & Azimuth compensation in Stereo Lab corrects for misaligned azimuth as well as imbalance in the cartridge (and indeed, the record level settings selected when making the needle-drop) without the need physically to slant the cartridge. 1. Azimuth refers to an angle around the equator of a spherical coördinate system. Its use in this context probably comes from a superficial connection with head-azimuth in a tape recorder where the term has some meaning, as it would have if the term was applied to Stylus Rake Angle which is analogous to head-azimuth. As it is, a simple term like stylus slant would be much more appropriate. 2. Many tonearms and/or headshells do not provide a mechanism to adjust azimuth in which case adjustments must be made by shimming the cartridge base (with shims or washers). 3. In the case of the cosine or figure-of-eight array. 4. This is not uncommon at all, even the best cartridges, the balance is rarely better than ± 1dB which is a 26% difference.